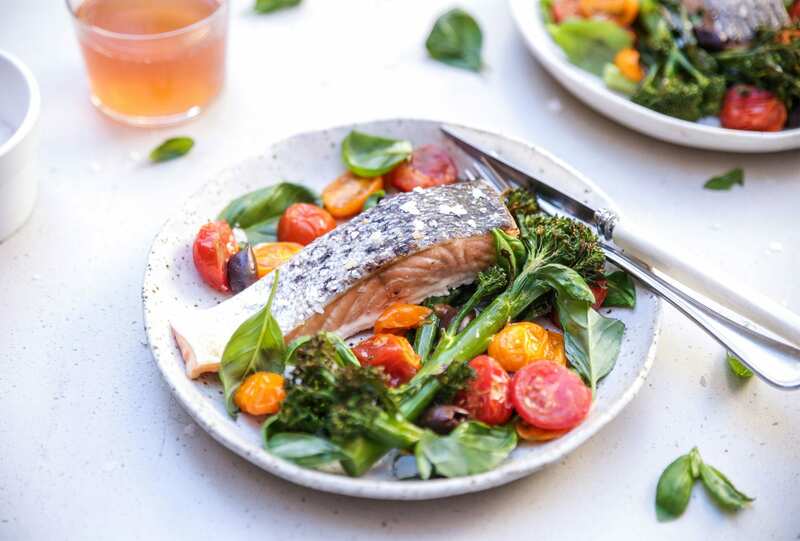 When you want dinner in 15 minutes, have minimal produce on hand but still crave a flavoursome and nutritious meal, look no further than this five ingredient recipe for Italian-inspired salmon. It’s light on your digestive system but robust in flavour and, with good quality salmon fillets, ensures you’ll meet your body’s protein requirements and boost your intake of essential fatty acids to support cardiovascular health, cognitive function, and to satiate the appetite too. Buon appetito. Preheat oven to 180C and line a large baking tray with greaseproof paper. Place all ingredients (except basil) on the tray. Drizzle with olive oil, season with sea salt and black pepper, and toss to coat evenly. Place in oven to bake for 12-14 minutes. Place onto serving plates or bowls, sprinkle with basil leaves and serve.